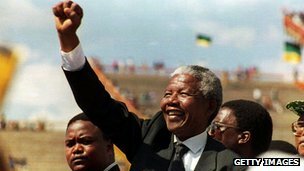 Since the passing of the great Nelson Mandela on Thursday there have been a great many tributes from around the world, and a series of fascinating articles around the web, stories from people that knew him, and tales of his past. When I lived in South Africa a few years ago, I took an interest in the history, seeking out a tour of Soweto run by the locals, which was far more in depth than the general tourist 2 hour tour (although I did pass on the mopane worms), and this included a tour of the Mandela house when he went to prison, as well as passing both his and Winnie’s new houses in Houghton and Soweto respectively. I also got to visit Robben Island, although I was a bit distressed at how fast we were propelled through it, I like to explore my history at slightly slower than warp speed! Anyway, in amongst the fascinating articles there were some that were frankly… random. There was the round up of streets in the UK bearing his name (did you know that almost 1/3 of all the streets in the world named after him are in the UK? ), examining how worthy they were. I’d like to think Nelson Mandela Square in Glasgow fared okay, but they were rather focussed on obscure English locations, like the road to Costco in Gateshead. Then there the striking Dunne’s workers in Dublin who refused to handle goods from South Africa during apartheid that would be attending the funeral. These ladies took a great stand, but I’m sure they weren’t the only people to have done so! I guess some people think it's not about what you do but how you look on the day. 3 cheers for Nelson Mandela for doing great things And being a fashion icon!! I read that bit about him too. Unfortunately that doesn't change how I feel about batik! A great,, great man, with poor taste in shirts, that is how Desmond Tutu described him. You have taken random to new levels. And all this random was handed to you!!!! Sounds like you have an interesting tour.